The overarching objective of this book is to analyse the manner in which statebuilding-oriented research has and can influence policies in fragile, post-conflict environments. Large-scale, externally-assisted statebuilding is a relatively new and distinct foreign policy domain having risen to the forefront of the international agenda as the negative consequences of state weakness have been repeatedly revealed in the form of entrenched poverty, regional instability and serious threats to international security. Despite the increasing volume of research on statebuilding, the use and uptake of findings by those involved in policymaking remains largely under-examined. 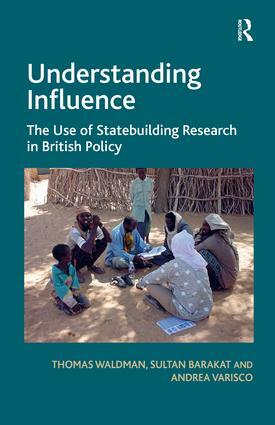 As such, the main themes running through the book relate to issues of research influence, use and uptake into policy. It grapples with problems associated with decision-making dynamics, knowledge management and the policy process and draws on concepts and analytical models developed within the public policy and research utilisation literature. This book will be of great interest to researchers, knowledge managers and policymakers working in the fields of post-war reconstruction, statebuilding, fragile states, stabilisation, conflict and development. Thomas Waldman is ESRC Post-Doctoral Research Fellow in Post-war Recovery at the Post-war Reconstruction and Development Unit (PRDU), University of York. Sultan Barakat is Professor of Politics and founding Director of the Post-war Reconstruction and Development Unit (PRDU), University of York. He is also a Visiting Fellow at the Brookings Institution in Doha. Andrea Varisco is a PhD candidate based at the Post-war Reconstruction and Development Unit (PRDU), University of York. His doctoral thesis focuses on the influence of research on British-led security sector reform in Sierra Leone.